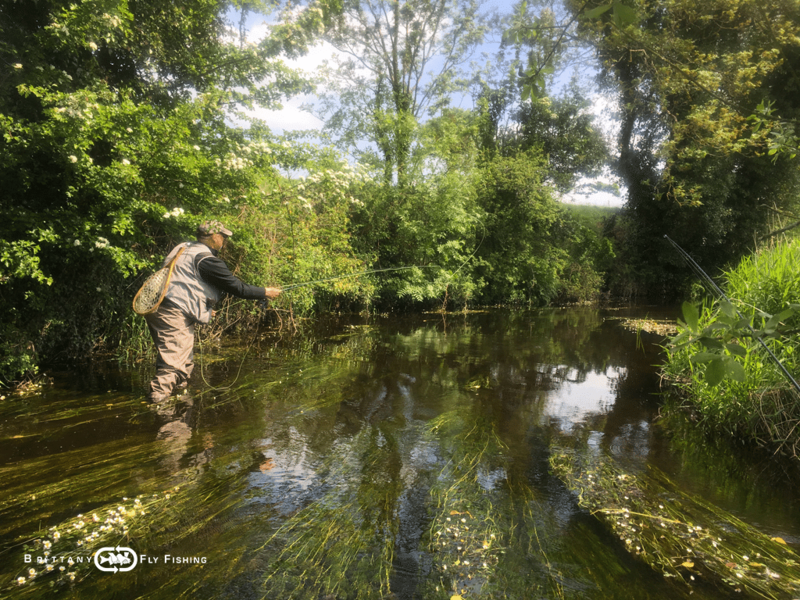 There are full of 100% wild brown trout looking to the surface as the waters are home to numerous insect hatches of great variety. 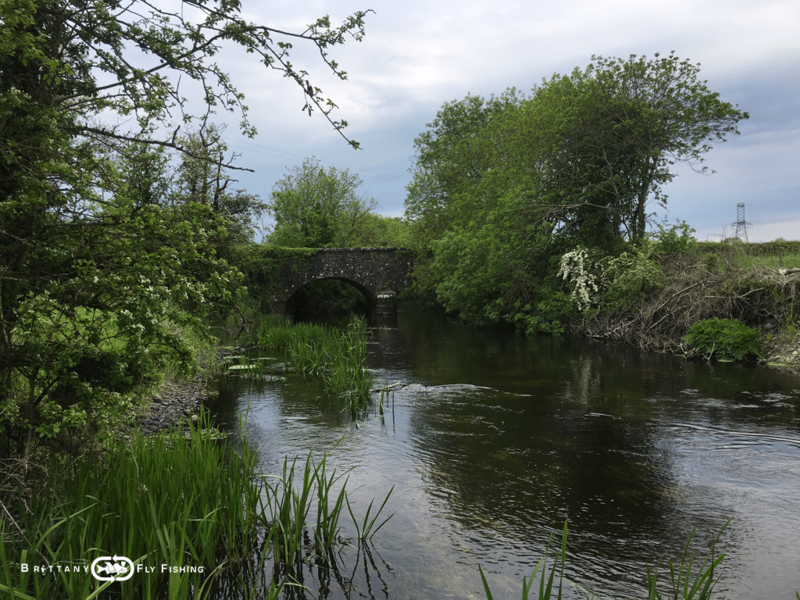 The rivers meander through farmland crisscrossed by hedges and home to cattle, sheep and horses. You will be hard pressed to find corn fields, pesticides and drained-out wetlands. It is a result of a unique model of agriculture that has not changed much in over 20 years in these lost valleys. 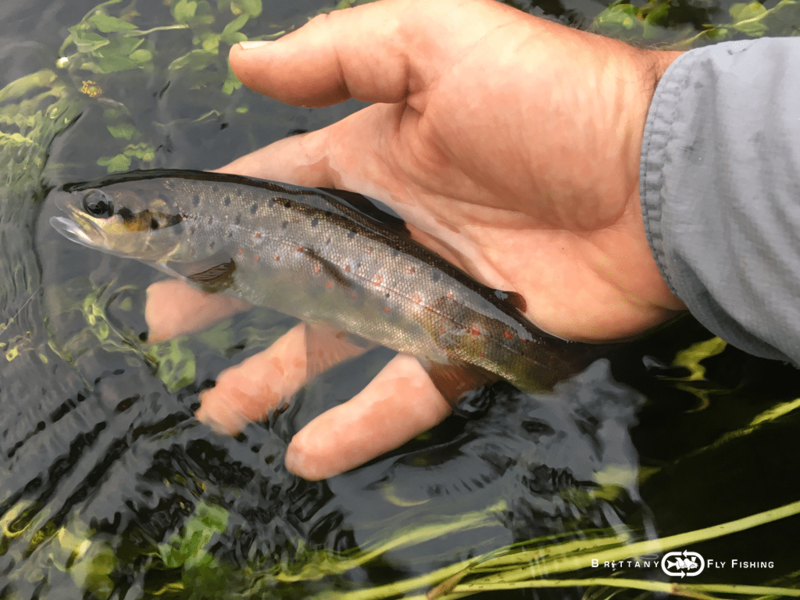 Insect hatches are multiple : ephemeroptera, trichoptera, stoneflies, terrestrial insects, they all will find their way into the brown trout’s stomach at some point. 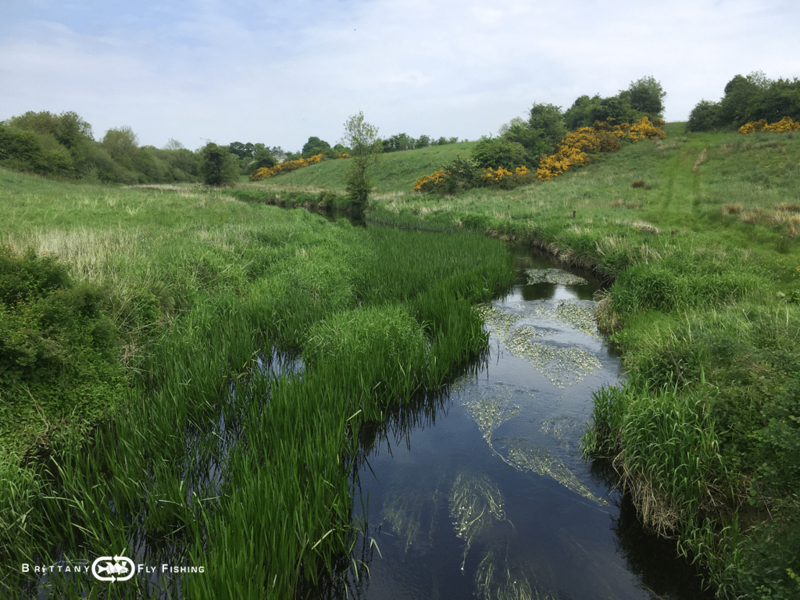 This is not trophy trout country (the big ones can be had a bit further north in Lough Sheelin) but a dry fly paradise for feisty trout in the 30/35 cm range with better, smarter fish reaching 40 cm in length. 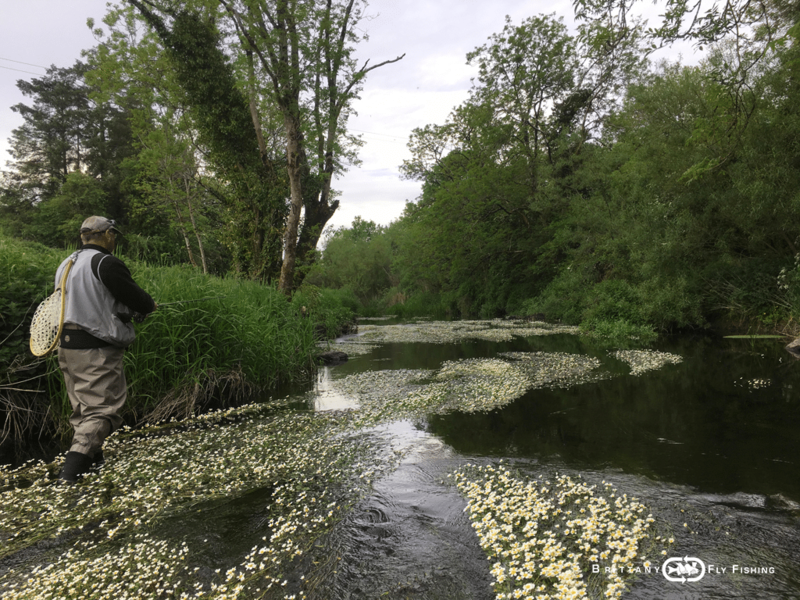 There will be bigger fish at hand, no doubt about that (my Irish friends have witnessed catches of trout weighing 3,5 lb sin the small rivers) but the main interest is the quality of the fishing in the places off the beaten path. 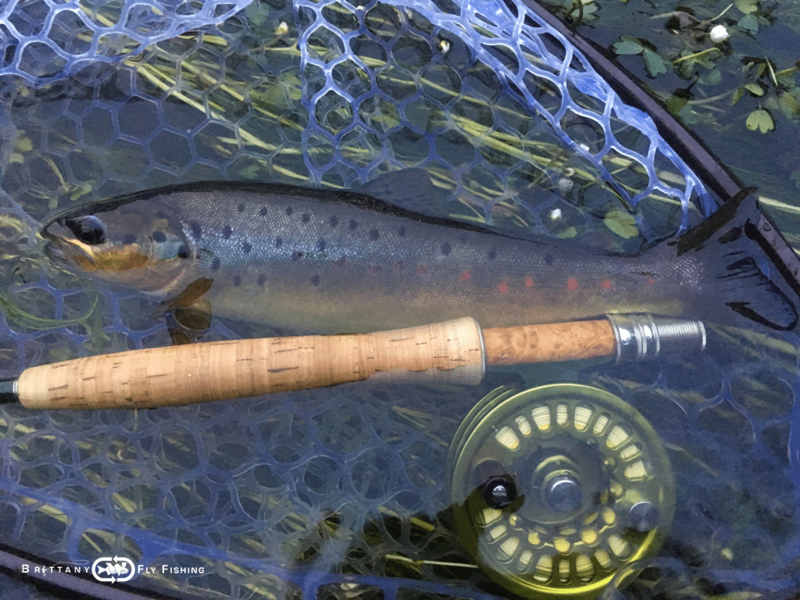 In our regions, free rising trout seem to be the exception these days, here the large amount of food has the fish look up to the surface, and they will feed with abandon if conditions are right, of course, usually when I am present from mid-April into June. 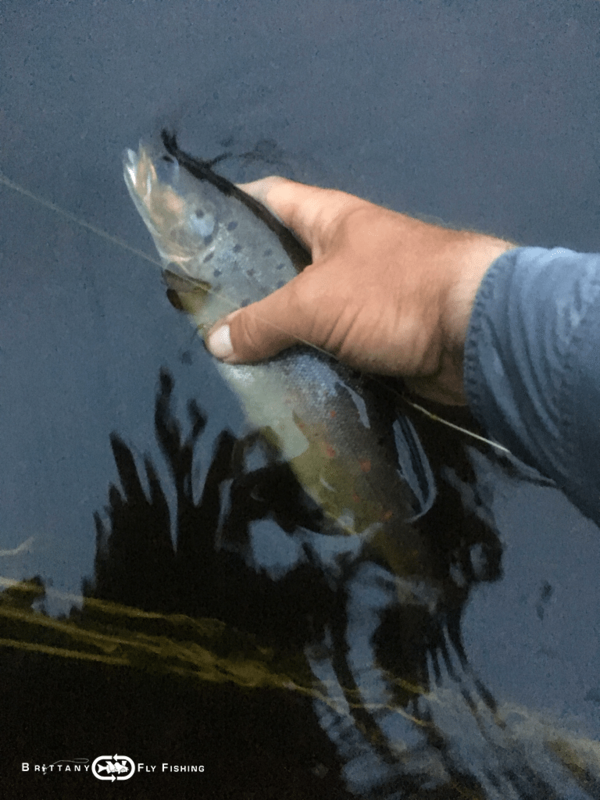 I am not into numbers but once the stars align, it is not unusual to experience body counts in excess of 40 to 50 nice fish in 5 to 6 hours of fishing, It actually takes longer to fight a hooked fish, to unhook and release him, dry your fly, check your leader than have another one pluck your fly off the surface again on your next cast. 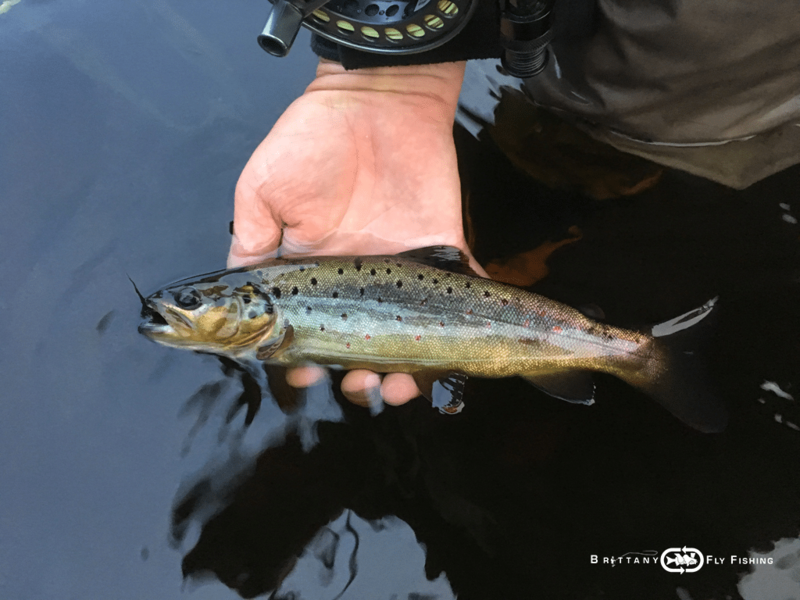 Despite their modest size, these waters are quite interesting to fish in a team of 2 anglers, you can take turns at every next rise ! 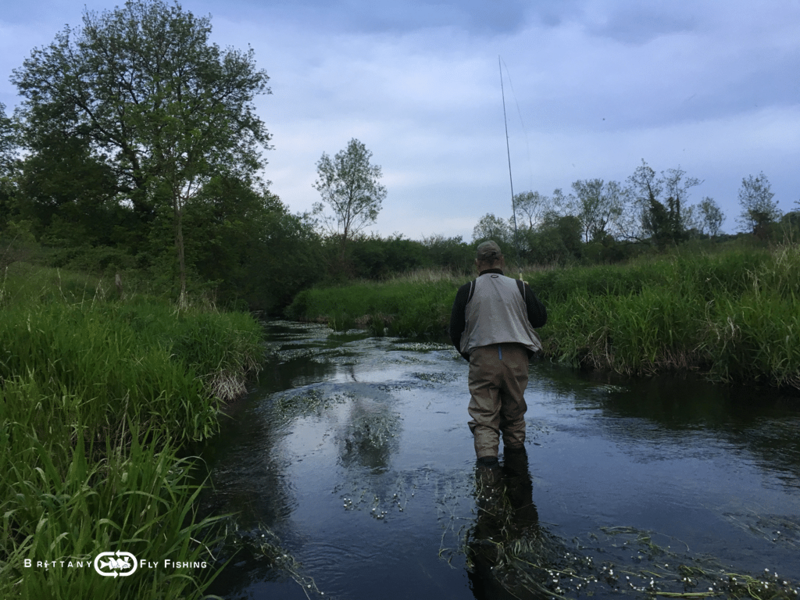 It is very active fishing, both great fun and contemplative. 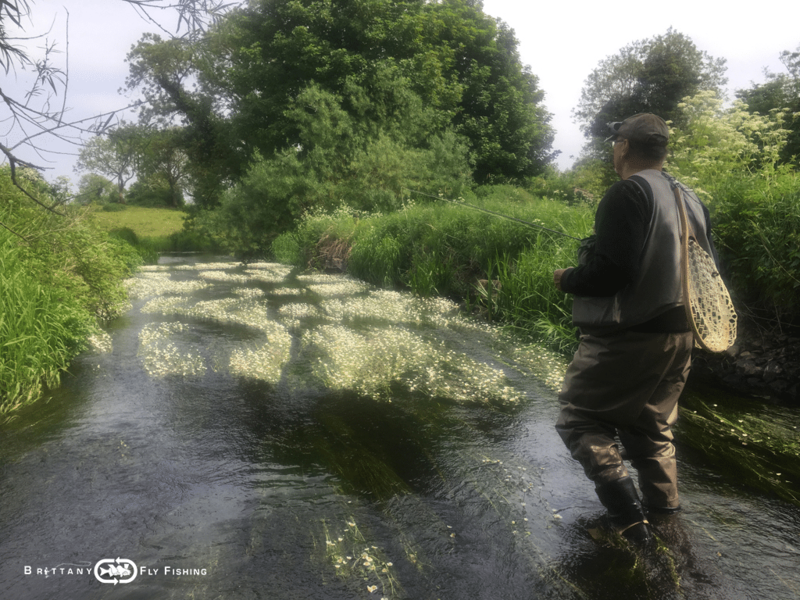 Having a guide at hand can be useful as he can help streamline strategies, give good advice, select fishy flies, unravel Gordian entanglements, retie leader tippets and last but not least take picures and footage of your memories. Lost a fish on the set, a good one has broken you off or has fallen off the hook in the weeds or a stump, so what ? You aim for the rext rise 6 feet above …if its’ not two feet to your left or to your right ! 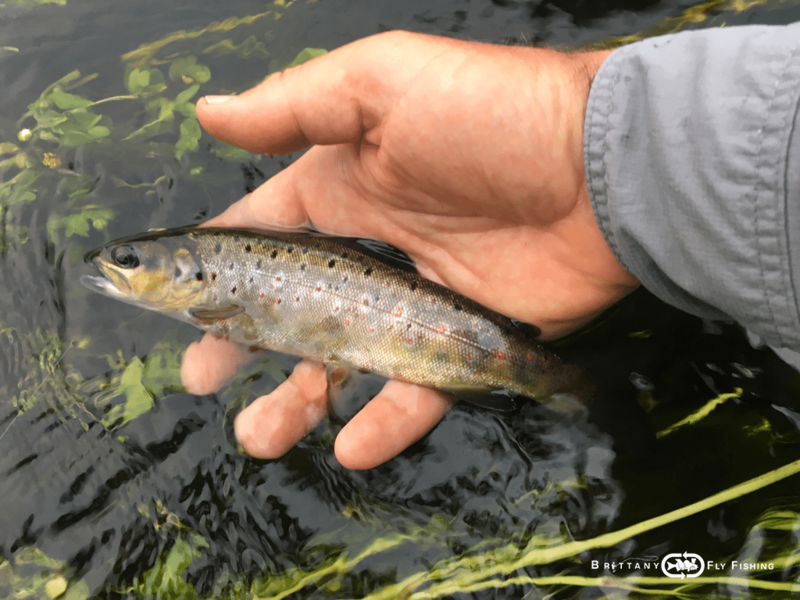 Ever since I have discovered these far flung places, I have regained my gusto for small-stream dry-fly fishing, something that had been the norm in my Breton home waters : careful approach, proper fly placement, accuracy, short casts, quick hoot sets and… choosing the right fly. 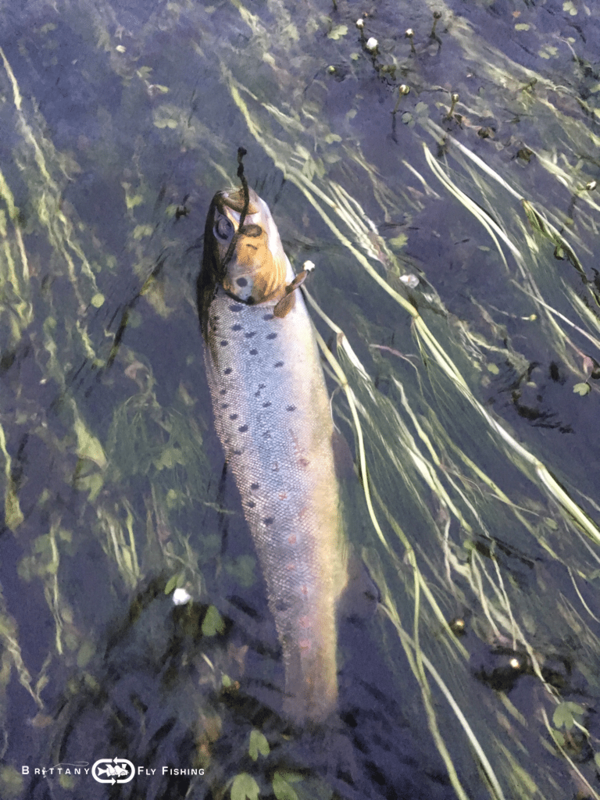 What pleasure it is to see it drift along naturally amidst 4 or 5 other species of mayflies, caddisflies, alder flies, buzzers and what not of floating appetizers. 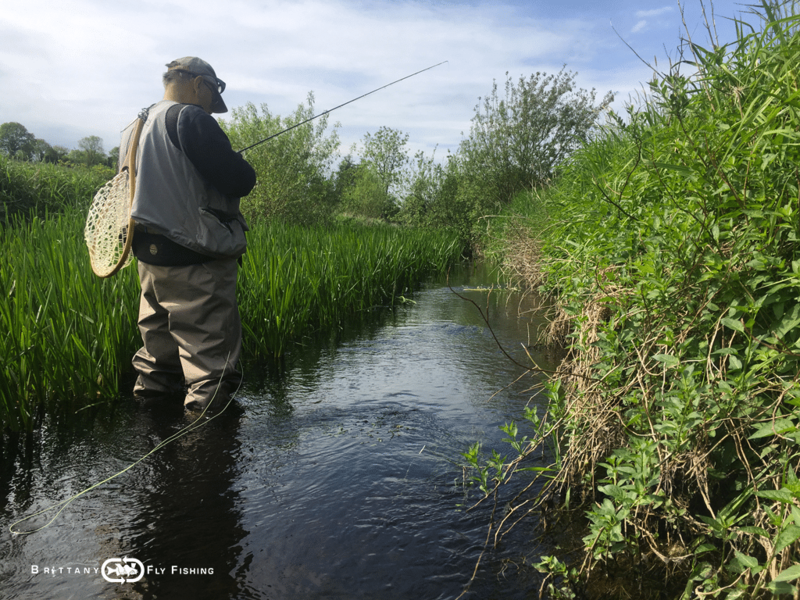 Later in the season, water levels can drop to the point of being too slow to warrant great fishing outside the morning and evening hours. I also have access to a large private property that harbors a superb river, some 10 to 20 meters wide at times. 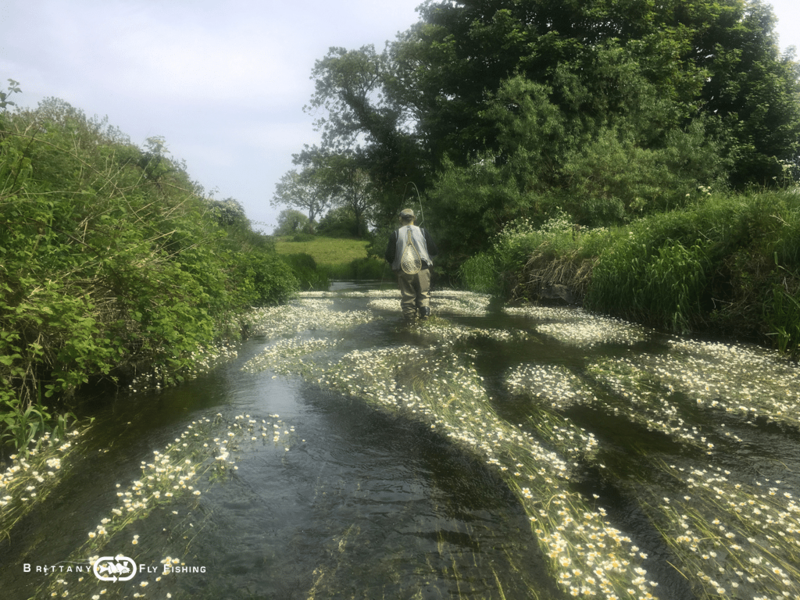 It is possible to make proper casts here and, besides presenting dry flies, anglers can fish nymphs, wets and even pull streamers for a pleasant surprise. I reserve the right to keep the identity of these “secret” waters to myself and my trusting customers. 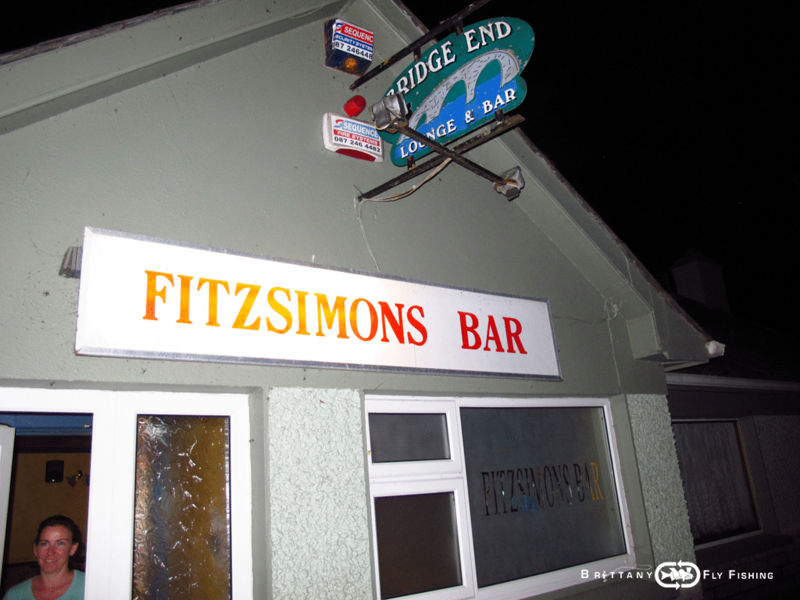 I will always be on the side of my customers when guiding in Ireland to help them discover this lost paradise. Please note that there IS a confidentiality clause to be signed in my travel contract.